1. You have developed the range of cake decorating kits exclusively with Trimcraft , can you tell us about the range? We at Fiona Cairns are very excited about our new range of cake decorating kits, which we have developed exclusively with Trimcraft. There is something for everyone from novices to those with more experience. Each kit contains a few useful and appropriate tools, a recipe card giving very clear instructions and lots of baking and decorating tips. You will also be able to link to the video demonstrations which we filmed in my own home kitchen. Beautifully packaged, these kits make ideal gifts. 2. Do you have a favourite product from the new range? I really like all the kits we are launching but I have to admit to one or two personal favourites. I have always had a passion for handbags! Creating the mini handbag cake kit was therefore especially enjoyable. I adore the lilac mock-crock clutch cake, imprinted using the fabulous rolling pin contained in the kit. My other personal favourite is the English Garden – full instructions and plunger tools to create your own exquisite tiny flowers and butterflies. 3. What advice would you give to baking enthusiasts who want to start cake decorating? It’s best to learn the basics before you take on something too ambitious. Baking is a science, once you have learnt the essential rules you can become more creative. 4. Where do you get your inspiration for your cake designs? We take pride at Fiona Cairns in being a very creative business. Our inspiration both in our baking and our decorations comes from all around the world. We have a wonderful creative team, always bursting with new ideas. Ideas come from all around – current trends maybe or even a flower in the garden, a pattern on a tablecloth or a flavour combination on a menu. 5. What would you say has been your proudest achievement in your celebrated career? Being commissioned to make the Royal Wedding Cake was the most extraordinary privilege for us as a company. We received the call in February 2011 and the wedding was in April, so we had a relatively short time to design and make the cake. A team of eight of us created the cake in our bakery, before it was taken to Buckingham Palace. The cake was designed to the Duchess of Cambridge’s brief and incorporated 17 sugar flowers from the Victorian tradition of The Language of Flowers. The Wedding cake was decorated with over 960 flowers and leaves. Each flower had a special meaning- for example, Lily of the Valley means sweetness and humility. The cake’s design very much tied in with the rest of the wedding; lace elements were piped on the cake, and architectural details from the Picture Gallery inside Buckingham Palace were created on the cake. It was a very exciting time for us; we had to keep pinching ourselves to remind us that we were involved. 6. Your cakes are always creative and reflect current trends, what do you predict to be the next cake decorating/ baking trend? Baking and cake trends are constantly evolving – which is exciting and helped of course by the Great British Bake Off! Currently there is a huge vogue for more natural baking colours and looking at health benefits. DIY and personalising trends are strong as people are being encouraged to make their own gifts. I love the fact that more and more people are getting into baking and cake decorating. I’ve written three books on the subject, packed with ideas and recipes. 7. 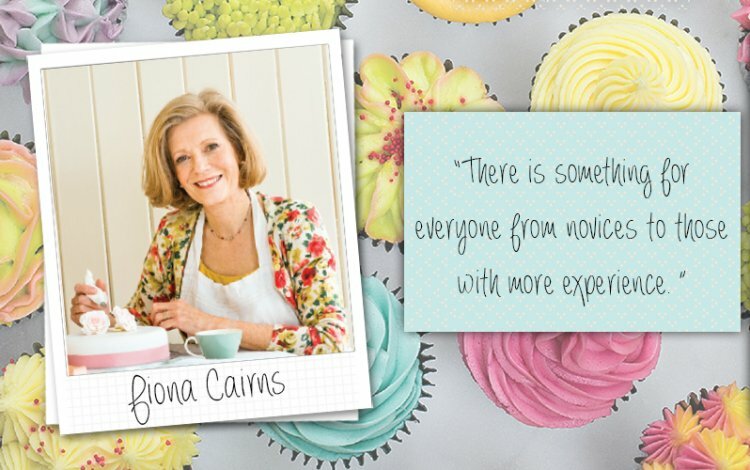 The Fiona Cairns Cake Decorating range in launching at the Handmade Fair in September, are you looking forward to the event and showing Kirstie Allsopp some quick cake decorating techniques? We are so excited that our Fiona Cairns cake decorating range is launching at the Handmade Fair. I will be showing Kirstie how to make a mini handbag or two – from cake! 8. We couldn’t finish our interview without asking what you favourite cake is? My favourite cake – a really tricky one to answer and it depends on the occasion. In the summer a light sponge cake filled with summer berries and a delicate rosewater or elderflower cream filling. In the winter months a dark gingerbread or rich boozy fruitcake.